What can you tell us about fjords? Adam Crysler lives in Vancouver and shot the photo of Howe Sound from The Chief in Squamish where he was living at the time on a day he got out of school early. Here is the information he sent me about that day. The story of that day was that we got off school at lunch and decided a hike was in order (as my friend and I often decide), and the closest thing with a decent view that wouldn't be crowded was The Chief. So we hiked up the backside (no scaling the front, I climb mountains...but not rock walls!) and peaked the 2 main peaks. The shot in the book is taken from Peak 2 looking up Howe Sound. You can see the Squamish Pulp terminal, and behind there is Mt Ellesmere, Foulger Peak. Those mountains actually back onto Sechelt / Salmon Inlet and border with Tetrahedron Provincial Park. Adam is now an officer on cruise ships. 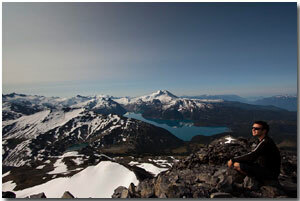 This photo of Adam shows him again in the BC mountains he loves. ___________(2000). "Coastline" in Encyclopedia of British Columbia. Daniel Francis (Ed.) p. 137. ___________(2000). "Dean Channel" in Encyclopedia of British Columbia. Daniel Francis (Ed.) p. 171. ___________(2000). "Douglas Channel" in Encyclopedia of British Columbia. Daniel Francis (Ed.) p. 182. ___________(2000). "Fjords" in Encyclopedia of British Columbia. Daniel Francis (Ed.) p. 253. ___________(2000). "Gardner Channel" in Encyclopedia of British Columbia. Daniel Francis (Ed.) p. 114. ___________(2000). "Jervis Inlet" in Encyclopedia of British Columbia. Daniel Francis (Ed.) p. 368. ___________(2000). "Knight Inlet Channel" in Encyclopedia of British Columbia. Daniel Francis (Ed.) p. 387. ___________(2000). "Map of BC" in Encyclopedia of British Columbia. Daniel Francis (Ed.) p. xvii. ___________(2000). "Portland Inlet" in Encyclopedia of British Columbia. Daniel Francis (Ed.) p. 568. Wikipedia has information about BC's fjords. So what can you share about the fjords of BC? Do you have a photo of a fjord? A story about one? An interesting fjord fact that would amaze others? Enter Your Title. Include the word "Fjord" if you can.